With the thousands of types of orchids available, it’s only a matter of time before your collection grows to include both high and low light orchids as well as cool and warm temperature orchids. When growing orchids indoors, the use of grow lights will increase the spaces within your home that you are able to grow your orchids. Anywhere from a closet, bedroom, or even bathroom will become an ideal location with the proper artificial lighting. If you don’t have artificial lighting or ample space within your home to grow orchids, the question becomes…how are you able to successfully grow orchids in the same area that have different cultural requirements. In this article, we’ll explore a few tips that will help you adjust the growing location to fit the needs of the varieties of orchids that are growing there. The first tip has to do with the pot and potting medium. Orchids that need to be kept moist all the time should be potted in plastic pots and sphagnum moss in order to retain moisture. For your orchids that need to be kept drier, you can pot them in clay pots and use a potting medium consisting of bark mix. This tip will help you keep orchids with different water and humidity requirements in the same area, although it is important to make sure and give each orchid its own individual care. Adding a humidity tray to certain orchids can also help. 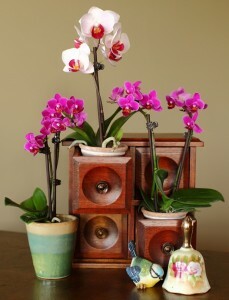 The next tip has to do with raising both cool and warm temperature orchids in the same area. When creating your orchid setup be sure to remember that because heat rises, you should keep your cool temperature orchids closer to the floor and the warm temperature orchids higher up. It is important to remember to provide air circulation for your orchids, so placing an oscillating fan on or near the floor can also help with the temperature for your cool-temperature orchids. During the winter months, when the temperature has dropped, you can also move your cool-growing orchids closer to the windows. The third tip has to do with growing low and high light orchids in the same area. In the same way that you want to place cool growing orchids lower and warm orchids higher, you want to do the same with high and low light orchids. Placing low light orchids furthest away from the light source and high light closer to the light source. The use of artificial grow lights makes this very simple: place low light orchids under less light intensity, and place your medium to high light orchids under more light intensity. By utilizing the tips above, you are well on your way to setting up the perfect environment for growing orchids indoors.